He is so sad and the shelter is too much for him. He needs your help now. Please SHARE, he's SO precious he needs a FOSTER or ADOPTER NOW. Thanks! Life at the Carson Animal Shelter in Gardena, California is unimaginably difficult. The chaos, noise, confusion and share terror of the environment is not suited enough for humans, as it is for dogs. Carson, a shelter known for its notorious high kill rate gives dogs just a few weeks, and sometimes just days to live, before the unthinkable happens: euthanasia. For an unnamed 3-year-old male Terrier, the situation is all too real. 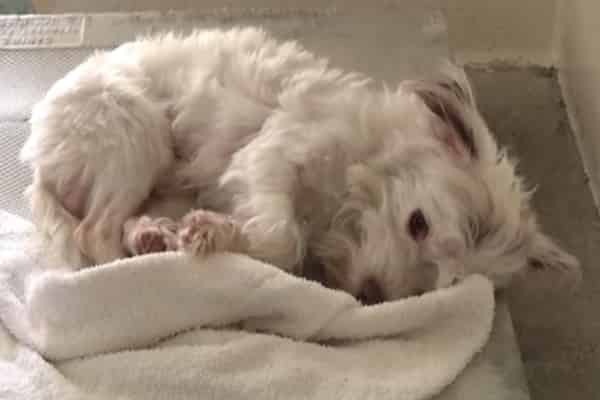 Her owner didn’t want her anymore, and so in a stunning betrayal, the pup was placed at Carson, where her situation is as dire as any new resident at the facility. The pup, who is trying to keep all hope alive, has broken down emotionally, according to a source at the shelter who wished to remain anonymous for this story. #A5116250 I'm an approximately 3 year old male Terrier. I am not yet neutered. I will be available on 10/3. You can visit me at my temporary home at C233. 20 Responses to "He was so badly hurt that nobody could adopt him, 3-year-old so sad and the shelter wants him OUT"
Can he be transported? I am in Texas. Is he a Westie? If so, why hasn't someone contacted Westie Rescue of California? May Karma find this skanks nursing home !! Has he been adopted yet? Yes or no? Could somebody please let us know whether this dog has been adopted . Thank You . Call the shelter at the number above to adopted this precious furbaby! If still there I will adopt. Live in Indiana if he can be transported. I am in Canada and I am willing to help get him out!! Confirmed with the shelter that his owner came back for him on October 3rd. This is so stressful. The poor animals are posted on Facebook, it sets off many people inquiring and anxious to get the pet, yet no one from this animal shelter will even post a phone number or reply to any of the concerned citizen about the update of the animal in question here. So many people from all over the county wanted to adopt this poor fur baby and all we read is that his family picked him up? -unacceptable stress ok?! When animal are posted for adoption via the web, there needs to be a responsibility on posting the Name of Place, Address and a phone number to contact for the adoption. After, an update as to the animals forever home. That poor baby ... put thru all that!